Home / Agriculture/ Will agricultural tax cuts help agriculture? Will agricultural tax cuts help agriculture? My history textbooks told me that Sri Lanka used to be called the “Granary of the East”. In fact, that is still an oft-cited phrase when talking about Sri Lanka’s agricultural sector. But today, local agriculture faces a declining and sometimes confrontational future. Government after government has tried to make sure that a sector that employs one in every four Sri Lankans remains important and viable in the global order, but even after spending billions of rupees in subsidies and tax cuts every year, political benefits aside, our farmers still find it extremely difficult to make a fair living. If the local agricultural sector and the two million Sri Lankans working within it are to survive, if not thrive, we need more targeted solutions moving forward. Arguably the biggest reason for the decline in agricultural importance is how much return agricultural investment brings. Agriculture often has a much lower return than an industrial or a service-oriented investment. An easy way to illustrate this effect is by using land as a unit of investment. An acre of land that is currently used to grow rice could bring maybe Rs. 350,000 of revenue every year but build a garment factory there and your revenue suddenly increases to a few million rupees a year. If you wanted to go further, build a software development house there and see how your revenue is even higher at the end of the year. This phenomenon leads to more and more people moving into these fields and more and more focus being placed on them as well, not only by private and public investors, but also by the supplementary services that allow these fields to thrive. Simply put, it makes more economic sense to focus on the service and industrial sectors rather than the agricultural sector, simply because it brings so much more return at a much lower relative cost. Given the seemingly obvious benefits of moving into these jobs, the first conclusion might be that those working in agriculture should simply change their careers. But things are rarely that simple. To start off with, skills and vocational training aimed at this shift is sorely lacking in the country. It might exist on some level, but it is in no way comprehensive enough to take in up to two million Sri Lankans. But the reality isn’t as straightforward as a lack of schools. Workers in the agricultural sector are also extremely reluctant, even opposed, to the idea of shifting careers. The apprehension that comes with venturing into a field that you know nothing about and leaving what you’ve done your entire life behind would be daunting to anyone. Combine that with the fact that agricultural workers tend to be far more hereditary in their profession, holding the same land and farming the same way their family had done for decades if not centuries, mean that they wouldn’t just be leaving a lifestyle behind, but an entire family tradition. 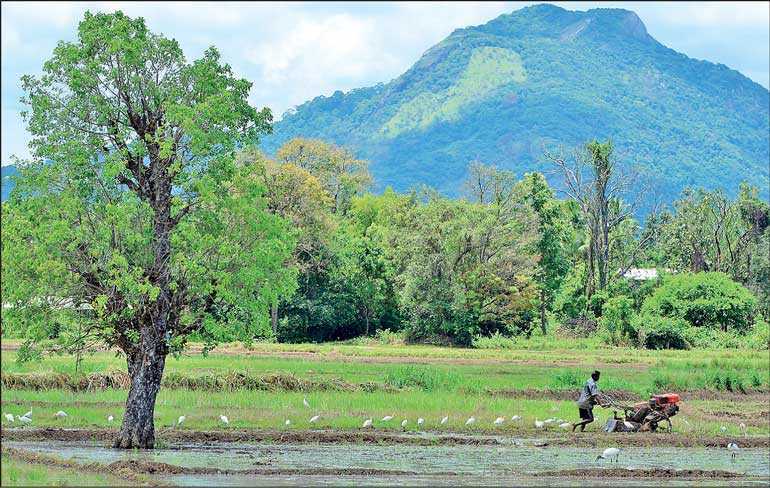 Sri Lanka needs to start moving the millions of Sri Lankans employed within traditional agriculture to more industrialised and service-oriented jobs. In the long run, a vast majority of these jobs have to be outside the agricultural sector. In the short run, modernising our agricultural sector will allow our citizens to maintain their own lives and priorities yet still ensure that both they and the country’s economy grows. Of course, the state could give up dozens of billions of dollars in tax revenue for a vague “incentive” for agricultural growth. But there are better and far more effective ways to go about this. Agricultural modernisation can take a step by step approach, starting off with projects such as small hydroponic stations manned by locals with three to four months of months training, and slowly increasing not only the scale and scope of such projects, but also the specialised training given to the workers. By making the process more and more technical and specialised, the amount of return one can get increases drastically. A farmer can add far more value to his crop by using a highly specialised aeroponics system as opposed to merely growing crops traditionally. Of course, this even helps Sri Lanka become self-sufficient if that’s necessary; modernised agriculture always brings far higher yields than traditional methods. Sri Lankan farmers will have fuller pockets and Sri Lankan bellies can be full of Sri Lankan food as well. Sri Lankan agriculture has always been an important part of our society. Economically, it might not have a strong future, but for the sake of the millions who depend on it for their survival, it must be protected and saved. Modernised agriculture needs to be the next step to ensure that the millions of agricultural workers in the country not only survive but are allowed to thrive. Billions of dollars in subsidies and tax cuts haven’t helped in the last few decades. They aren’t going to help now.